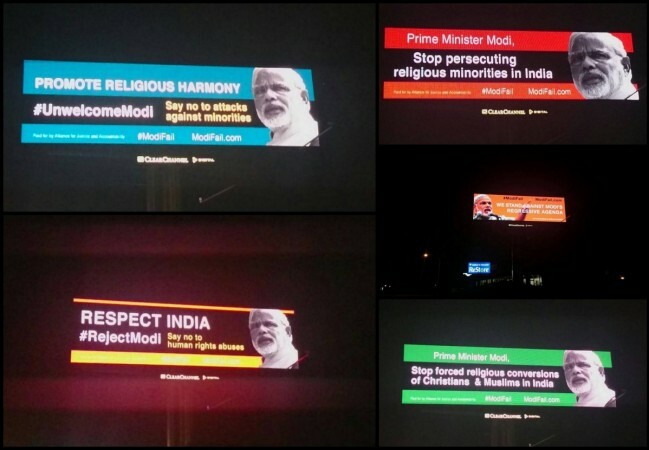 Massive digital hoardings have come up in San Jose, California ahead of the much anticipatedgrand reception at SAP Center organised for Prime Minister Narendra Modi, accusing him of implementing “regressive” policies in India that hamper “freedoms and human rights” of Indian communities. The hoardings have reportedly been put up by the Alliance for Justice and Accountability (AJA), a liberal judicial watchdog group in the United States. AJA, which has teamed up with several anti-Modi groups, will also hold a protest at the SAP Center on 27 September “under the banner #ModiFail, to expose the realities behind Modi’s alleged “accomplishments”, the group said in a statement on its website. “Narendra Modi is visiting Silicon Valley to talk about ‘Digital India, but we are worried by his record. Digital Indians deserve strong privacy and free speech protection,” Anirvan Chatterjee of AJA said. 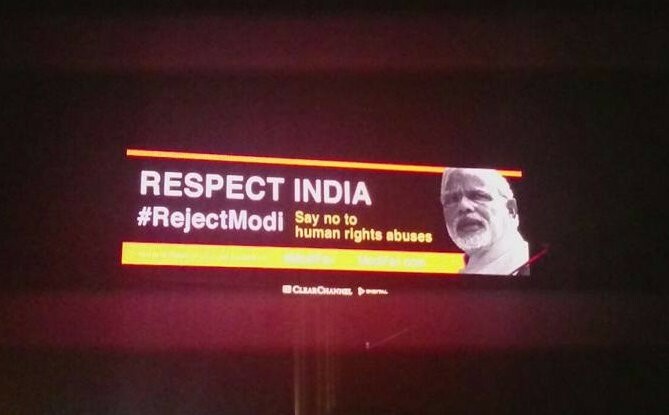 Dozens of electronic hoardings with messages such as “Respect India #RejectModi Say no to human rights abuses” have been put up on San Jose streets. Another protest banner reads “Prime Minister Modi, Stop forced religious conversions of Christians and Muslims in India”. In its statement, the anti-Modi group said that it will be reaching out to elected officials and corporate leaders in the US to “inform them about Modi’s failed and regressive policies that negatively impact human rights, religious freedoms, the environment, and overall: shrink the space for civil liberties under his rule”. “Silicon Valley leaders and the general American public need to recognise how dangerous Modi’s record in office is,” said Pieter Friedrich with the Sikh Information Center, also a part of the anti-Modi group. “Instead of offering Modi and his supporters an opportunity to whitewash his past crimes and gloss over his present policies, we ask them to hold Modi and his government accountable for the severe threat to the freedoms and rights of all Indians,” Friedrich added. The group also pointed out that Modi, who was banned by the United States government from entering the country for his alleged role in the 2002 Gujarat riots currently enjoys “diplomatic immunity”. Since getting elected, India has witnessed an increase in violence against Christians, Muslims, Sikhs, Dalits and other marginalised communities, the US-based anti-Modi group claimed. AJA emphasised in its statement that while Modi is being welcomed at SAP Center in San Jose as part of his global PR campaign, it will assemble in “safe permitted free speech areas” to tell people about the “other side of the story“. The group has also launched a website–Modifail.com–to expose the “false claims perpetuated” by the Modi government. Reality bites. What about Indian Media – sound and fury signifying nothing.